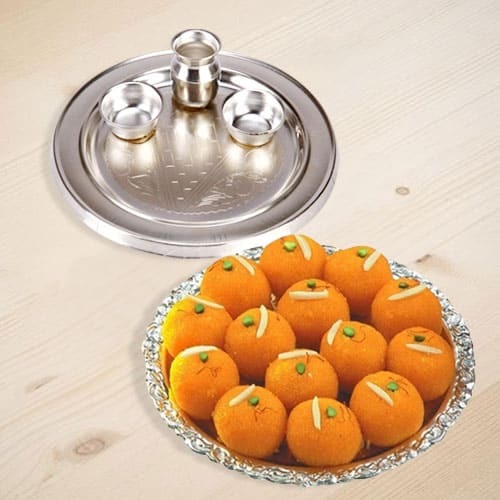 Silver Plated Thali (Size: 5-6 inch) with Motichur Laddu 1/2 Kg. (Gross Weight) from Haldiram. Flowers Delivery Madurai, Send sweets Chittorgarh, Wedding Cake Durgapur, Diwali Mithai Madanpalli, Send Flowers and Gifts to Salem, Online Shop Latur, Flower to Garmukteshwar, New Year Flowers Madanpalli , Fresh Fruits Hoshiarpur, Send Gift Nagpur, Dry Fruits to Trivandrum, Birthday Delivery Gajraula, Sending to Gajraula, Flower shop Kollam, Kottayam Online Cake Delivery.